Back in 1977, in my school lunchroom, I overheard some boys at the next table talking about a game where your character went into a dungeon, battled monsters, and gained experience that made him even better. Later at home, I opened the telephone book, and started calling hobby shops until I found a distant, magical store with a copy of Dungeons & Dragons on the shelves. Since then, I’ve experimented with Traveler, Runequest, The Fantasy Trip, and GURPS. I’ve run virtually rules-free games, and designed my own homebrew RPG. Third edition lured me back to my first gaming love of Dungeons & Dragons. 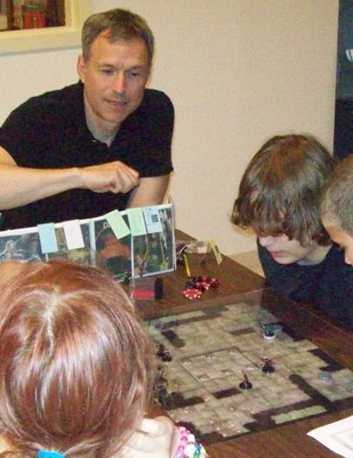 You can find me now serving as dungeon master a weekly D&D encounters session, occasional Adventurers’ League games, and judging at the big gaming conventions. Saw your comment about pymapper. Could you post any links to tile sets you know of? Your dungeon tile gallery may be one of the most valuable resources I have found online in a long while! I have a LOT of tiles and I’ve been wanting to put the sets back together (in bags or boxes, etc.) and your site is IDEAL!!! Thank you for doing this!!! Scott, Thanks for the good word. Your encouragement inspires me to think of other resources that I could add. For instance, sometime I plan to do a gallery of poster battle maps that’s more complete than others available on the web. This! Thank you so much. I ended up just selecting the pictures of the tiles and printing selection. Came out to 2 pagers/set, easy reference for which set to look in for the piece I want. Thanks for the gallery of dungeon tiles. Viewing them is helping me determine which sets to purchase. You have provided us with a great resource. Time to start reading some of your posts. I will direct friends to your site. I randomly stumbled upon your blog and have quickly added it to my MUST READ list. You have a plethora of amazing ideas, tips, tricks, and commentaries. Thank you so much for publishing this and I can’t wait to become an active part of this community. I just wanted to let you know that I am enjoying your blog – lots of good tips for Dungeon Tiles use, and lots of insightful ideas for the tabletop. Keep up the great work! Congrats on your website! I have installed pymapper but cannot load any tiles on it (I downloaded Dungeons Master Set and Ruins of War) Any hint is welcome. Thanks for your site. It’s really useful and inspiring. I am interested in the sets for pymapper but cannot find them anywhere. Could you please share some links? Thanks for the Website and all your words. I enjoy reading your stuff. It all started with heavily home-ruling 4E for a low-magic campaign my girlfriend was DMing in her own setting. Once WotC announced Next, I gave up on all the tethers I kept to ensure functionality within 4E, and soon found myself so far from base that I scrapped D&D entirely. I started building out from the original rules and mechanics I’d created, to finally make a game that represented my own ideal balance of verisimilitude and playability. After 3 decades of gaming (intensely for a few years, then off, then back on again, etc), I’m writing my own TRPG. As I attempt to embody my aspirations as a player into a ruleset, I’m hoovering all the data and commentary on existing systems that I can. This blog has proved to be among the most useful things I’ve found in the 2 years (so far) of this project. Your balanced insights and engaging history lessons have been great in spurring creativity and helping me avoid mistakes. I just wanted to say, “thanks.” Oh, and please keep going! I will gladly accept your offer. I’ve always wanted to add the master sets to the gallery, but I lack intact versions. I am 24 and just started really getting interested in dnd. I never was a big board game guy. Neither was my family but my brother got me the starter set 5th edition for Christmas. Well needless to say I’m am in awe and am ready to learn more. What do I need to buy ? I bought the players manual today. Can I use 4th edition tiles with the 5th edition stuff? Do I need miniatures? Sorry about the questions but you know what your talking about if you would just take a few minutes to answer those questions that would be great! I will be reading through your website as well! Thanks! Welcome to the game and thanks for reading. I’ve been considering a post on the basics you need to buy to run a game. Your question may spur me to write that post. Here’s the short answer. To start, all you really need is the free-to-download Basic Rules and a set of dice. The Player’s Handbook expands your character options and makes a good first purchase. If you want to be a Dungeon Master, the Monster Manual adds monsters beyond those in the free Basic Game. The Dungeon Master’s Guide can wait until you’ve run a few games and feel like you want a deeper dive. It’s a great book, but you could play for years without it. I prefer to run most encounters on a battle map, so I recommend the Basic Pathfinder Flip-Mat. You can draw maps on the mat using either wet or dry erase markers, and then wipe them off. You do not need to invest in miniatures. Instead, just use any tokens that you can tell apart. For example, a lot of convention judges use Starbust candies to represent creatures on the battle map. They come in a variety of colors, and players like to eat the monsters they slay. You can also use 1-inch washers or game pieces from other games. D&D is a game of imagination first. While you can use the 4E dungeon tiles with the 5E game, you hardly need them. The 5E game plays so much faster than 4E that you won’t want to pause to lay tiles. I like your site! I’m preparing my first campaign for my first time as Dungeon Master. And I have a question: How do you determine if your monster/s or villian/s are the appropriate level for your characters? Thanks! You can find guidelines for appropriate monsters to pit against a party on page 56 of the Dungeon Masters Basic Rules or on pages 81-82 of the Dungeon Master’s Guide. Just wanted to say I think your site is great. Every time I come here and read your articles I feel empowered. I never feel like I’ve wasted my time. You always have very insightful things to say. It’s great that I can come away feeling like I understand this hobby more, as well as feeling like I can immediately become a better Dungeon Master. Thanks for the words of encouragement! Comments like yours keep me posting. I truly appreciate your immense knowledge of Dungeons and Dragons. I have searched many sites for information and yours is the most complete site I have ever come across. Thanks to this I have purchased nearly all I need for an amazing event I will be holding at our shop…except for one thing the Lair assault: Temple of the Sky God. I simply cannot find this ANYWHERE for sale! I just don’t get it! Was this an actual module? I have managed to get unopened modules from 2004 in mint condition, yet cannot find any for this and it is only from 2012. Help please! I really need this badly. Do you have any info that could help me find it? Specifically I need the maps more than anything. product on Kickstarter called ‘Epic Hero and Villain Feat Cards’. I think they are something that you and your readers would appreciate. Check it out if you have a second and let me know what you think. We are over 300% Funded with 10 days to go and we’d like your opinion on if we have a product worth listing. I have several different maps and tiles that I have been collecting and “cleaning” up over the years. I continuously search the internet looking for ones that I don’t have or ones that are better then what I currently have. This is an awesome site that provides many I don’t have. If anyone would like to trade or might want to see what I have just let me know. We’re roughly the same age — I’m a huge fan. What’s the “best” 5e module you’ve come across to date? PS — what’s your email? Thanks for the kind words. For me, Out of the Abyss had a rough start, but it has developed into my favorite. The Lost Mine of Phlandelver also merits consideration. You can reach me by sending to dave at this domain. Hi, David! You’re under no obligation to participate or even acknowledge, but I plugged your blog as part of a “Real Neat Blog Award” campaign. If you do want to engage, you can follow the basic format of my post below, and then answer the five questions I’ve created on your own post. Thanks for honoring my blog with the nomination. I started DMDavid because I felt an itch to talk about D&D’s design and history. During the first year or so, when I wrote purely for kicks for no readers, I figured I would try to keep going for a year. Eventually, I thought someone at a con might recognize my DM screen or that another blog might cite one of my posts. Anyway, kudos like yours keep me writing. Plus, I’m still having fun sounding off about D&D. Love your blog! Very informative, especially when you delve into the roots of this fascinating hobby. Glad you like the blog. Encouragement from readers keeps me writing. I’ll keep the D&D history coming. Thanks! Also not sure if I’ve just looked over it or not but I have been wondering what all could a DM do with like creating custom magic and legendary items for the other players to find, that you know would not just make the game far to easy for them, cause I do put them through a lot and I do want them to find stuff other then 10 – 20 gold. I’m delighted that my site has helped your game. Fifth edition’s rule for attunement makes breaking the game with too much magic harder than in 3.5. If you want to make magic items seem more special, give them an interesting description and some flavorful side effects. For instance, a wand could be shaped like a tentacle and constantly damp. A frostbrand sword might give its wielder a bluish color and make their breath fog. Then have your players give their new magic sword a name. Please, please, please … the internet needs posts from you at a much more frequent pace. I love your blog. It’s a fantastic gaming resource. I’m grateful for the words of encouragement. Whenever I feel like skipping the next post, comments like yours drive me back to writing. As for more, I’m typing as fast and often as I can. Thanks! I love the site! You have many excellent posts. I think my favorite so far is the one about Wandering Monsters, which brings me to my request. I always feel silly starting a conversation with a total stranger by saying ”well met’ but I try to stay in character. Feel free to delete this if I’ve offended you. I do enjoy your opinions, and so I am hoping you will consider my Kickstarter for review. I will be relaunching at the end of March. If this sounds like something that interests you, I’ll send you a ‘blogger’s version’ to review. Let me know what you think. And I apologize for the intrusion. Hi DM David. Just wanted to let you know that your blog is very appreciated and a tremendous resource. It started with me using your Dungeon Tiles gallery (to figure out which ones I’d want to get) but I realized that your monthly articles are a gem. Keep up the great work! I was also a teenage DM in the 1980s (back in the day when the original printing Deities & Demigods still had the Cthulhu Mythos included), then left the hobby for a couple decades as real life took me away from gaming, only to come back now when 5th Edition lured me back. Great blog you have here. I also found your maps and tiles sections invaluable. Thanks for that. I’m currently enjoying reading your posts specific to the origins of D&D and was wondering two things. First, where are you getting the information? And second, would you consider publishing it as a book? There is a lack of this type of material out there and the audience is getting larger, I think. Your writing chops are superior so if you were considering it, consider this an unbiased, unsolicited request. Kudos DM David. Thanks for the kind words! Most of my information for my posts on the origins of AD&D comes from interviews, forum posts, and articles written by the folks involved. I’ve also drawn from books on the subject. Jon Peterson’s exhaustive, scholarly tome Playing at the World tells the story of D&D’s creation. I drew some tidbits from Of Dice and Men: The Story of Dungeons & Dragons and The People Who Play It by Dave Ewalt, Empire of Imagination: Gary Gygax and the Birth of Dungeons & Dragons by Michael Witwer, and HAWK & MOOR- The Unofficial History of Dungeons & Dragons by Kent David Kelley. As for the book, I’ll never say never. Are you willing to do a product review? If so, please send me an email (or check the facebook messenger) for some more info. Hi David. I love your blog. I came across it while doing web searches about the Fez Tournament and the D&D Open. I’m one of the guys that runs Nascrag these days. We are still going strong. Gen Con 50 will be the 38th anniversary of Nascrag and the original Fez: Valley of Trees.